Mercy is a sweet, cuddly, and playful boy. He has a huge heart and just wants to be with his people. He was emaciated when he arrived at a shelter in SC, but he is doing well and gaining weight. Despite clearly having been through hard times, he has nothing but love to give! 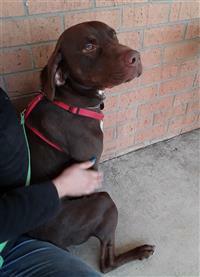 Mercy loves cuddling with his people, playing with toys, and going for walks. 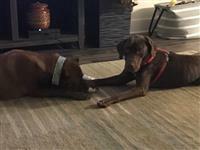 He gets along great with the other dog in his foster home and they love to play together. We are guessing he is around 2 years old, but he thinks he is still a puppy! He has lots of energy and just needs some direction. He wants to please and we think he learns quickly! Please let us know if you are interested in meeting Mercy - he loves making new friends!